U.S. stock futures are flat in pre-market trading for Thursday, August 4. The Dow Futures are lower at 18268.0 for a loss of -1.00 points. The S&P 500 Futures are lower at 2156.0 for a loss of -1.00 point. The Nasdaq Futures are lower at 4720.0 for a loss of -8.25 points. The Russell Futures are down at 1208.0 for a loss of -3.00 points. In overnight trading in the Eastern Hemisphere Japan’s Nikkei 225 is at 16254.89 for a gain of 171.78 points or 1.07 percent. Hong Kong’s Hang Seng Index is at 21832.23 for a gain of 93.11 points or 0.43 percent. China’s Shanghai Composite is at 2982.43 for a gain of 3.97 points or 0.13 percent. India’s S&P BSE Sensex is at 27714.37 for a gain of 16.86 points or 0.06 percent. In Europe, the FTSE 100 is at 6624.18 for a loss of -10.22 points or -0.15 percent. Germany’s DAX is at 10230.83 for a gain of 60.62 points or 0.60 percent. France’s CAC 40 is at 4331.32 for a gain of 10.24 points or 0.24 percent. The Stoxx Europe 600 is at 336.91 for a gain of 1.33 points or 0.40 percent. On Thursday the following reports are on the economic calendar for the day: Chain Store Sales, the Challenger Job-Cut Report, Jobless Claims, the Gallup Good Jobs Rate, the Bloomberg Consumer Comfort Index, Factory Orders, the EIA Natural Gas Report, the Fed Balance Sheet and the Money Supply. Rob Kaplan from the Federal Reserve will also speak on Thursday. In pre-market trading, stocks trading actively include the following: Kraft Heinz, Royal Caribbean Cruises, Facebook, Monsanto, Verizon, CF Industries Holdings, eBay Inc., Carnival Corp. and ConocoPhillips. Approximately 400 companies will report earnings on Thursday. On close watch will be Restaurant Brands International, Kraft Heinz and LinkedIn. Also on watch for the day will be the Bank of England’s decision on its central bank rate. Stocks in the U.S. have been trading within a small range as price volatility is low. Price volatility is expected to remain low in the weeks ahead as market factors are stable. 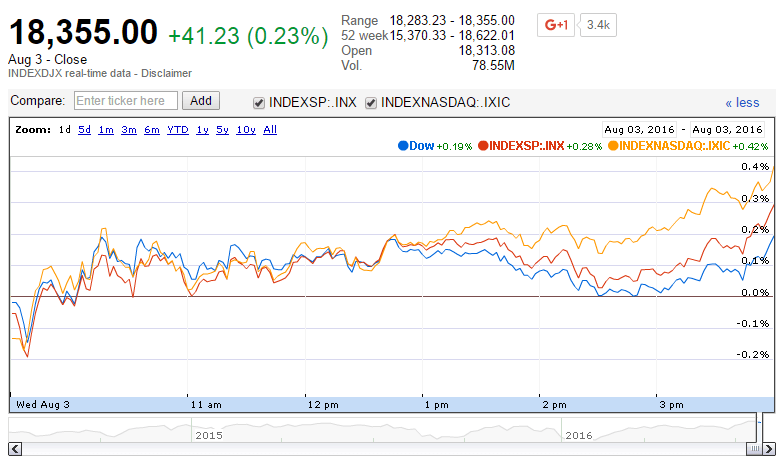 On Wednesday, the Dow Jones Industrial Average closed at 18355.00 for a gain of 41.23 points or 0.23 percent. The S&P 500 was also higher, closing at 2163.79 for a gain of 6.76 points or 0.31 percent. The Nasdaq Composite closed higher at 5159.74 for a gain of 22.00 points or 0.43 percent. Other notable index closes included the small-cap Russell 2000 Index, higher at 1212.73 for a gain of 10.38 points or 0.86 percent; the S&P 600 Small-Cap Index, closing at 736.52 for a gain of 4.02 points or 0.55 percent; the S&P 400 Mid-Cap Index closing at 1546.64 for a gain of 9.35 points or 0.61 percent; the S&P 100 Index closing at 958.83 for a gain of 1.71 points or 0.18 percent; the Russell 3000 Index closing at 1277.97 for a gain of 4.97 points or 0.39 percent; the Russell 1000 Index closing at 1198.62 for a gain of 4.20 points or 0.35 percent; the Dow Jones U.S. Select Dividend Index closing at 618.07 for a gain of 0.62 points or 0.10 percent.